So here’s the honest truth: For years, I thought Brussels sprouts were absolutely disgusting. There are very few things I can’t stomach (thanks to my mom always making me eat everything on my plate! ), but Brussels sprouts were on my very short “Things I Hope I Never Have to Eat Again” list. That plan was going great until we went over to someone’s house a few years ago and they served us roasted Brussels sprouts. I ate them because I wanted to be polite, not knowing that my whole opinion of Brussels sprouts was going to completely flip on its head as a result of my effort to be polite. Let me tell you: there is a major difference between roasting something and boiling something — at least when it comes to Brussels sprouts! Once I’d had a bite or two of these roasted Brussels sprouts, I promptly reneged every last thing I’d said about how much I despised Brussels sprouts. I was hooked. How come I had gone years of my life not knowing about this amazing-ness?? So recently, when I saw this recipe in the latest issue of All You magazine, I ripped it out and set it on the stack of recipes Jesse had on his desk to use for planning next week’s menu. And I hinted around at how amazing they looked. My man knows the way to his woman’s heart, that’s for sure. Also, I still cannot believe I am swooning over Brussels sprouts! It almost feels like I need to apologize for that. Or wonder if I’m on the verge of a midlife crisis or something?! I and so many of you requested the recipe that I wanted to share it here. Since I don’t want to keep a good thing to myself. Put the Brussels sprouts in a bowl. Pour the oil over and sprinkle with salt and pepper. Toss to coat and season. Put a single layer on a cookie sheet, cut side down. Roast for about 35 minutes at 350 degrees — until tender and edges are starting to brown. 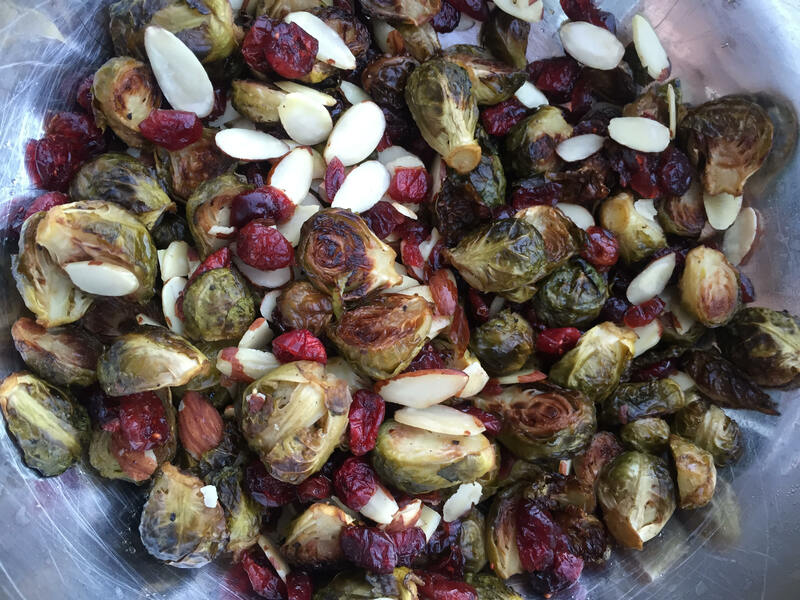 Take cookie sheet out of the oven and drizzle Brussels sprouts with honey and sprinkle with cranberries and almonds. Put back in the oven and bake for another 5 minutes — or until warmed through. Yay for fall recipes! Just a quick comment though, as at least for me, the recipe card doesn’t seem to indicate the oven temperature? 🙂 Thank you so much! I just fixed it! So sorry about that! By the way, ibotta has a 20 cent rebate on brussel sprouts. It’s not much, but every penny counts! Oh, thanks so much for mentioning that rebate! I *love* roasted brussel sprouts!! Unfortunately they have to be eaten in small quantities for me because of IBS but I do love the way they taste. For acid reflux. Take one tablespoon unpressed vinegar. Brags I think in health food dept at. Kroger. It helped my husband. I can’t take it because it take my breath and inhale it. It is also very good for other things. Do it every day for a while. I just bought brussel sprouts this week with a plan to do something similar. They are SO yummy! Also delicious made in the skillet with bacon!! Roasting is great for a lot of vegetables. Try carrots, broccoli, cabbage wedges, cauliflower, or asparagus! Just toss with a little olive oil, salt, pepper, and put in the oven at 400 ish (or whatever temperature your other food needs to be at). My husband has been making roasted broccoli recently, too, and that is SO good! So, I think I’m a little late to the roasting party, but I just roasted broccoli for the first time last week. Amazing! My husband tried some and said, “Yup. That’s the way broccoli should be eaten.” I’ll have to try the brussel sprouts soon! We love roasted Brussels Sprouts. I saute garlic and add lemon juice and add that after roasting. At Thanksgiving for 8 people I will make four pounds, and they will be the first dish gone. My kids cheer when I buy them. We all like them, too, either roasted or steamed. My kids get excited when I bring them home (but then they like most veggies). Will have to try this recipe. We love them too!! I salute some bacon and onion til not quite done, add the cut sprouts and salt and pepper, sauté for a bit, then throw the pan in the oven to finish (a little faster this way). Funny story, we were in Costco and I picked up a bag of Brussels sprouts and my then 4yr old shouts “Oooo Brussels sprouts!! I LOOOOVE Brussels sprouts! !” I heard several people burst out laughing!! I love Brussels sprouts too! We were just talking ablut how good they are during lunch at work today. LOL I haven’t roasted them, but I need to try it. I usually slice them and stiry fry them with olive oil and garlic seasoning. Sometimes I toss them in a little soy sauce to finish them off. Delicious! I have been roasting them for a few years and have converted those also who didn’t like them fixed other ways. I now have to bring them to Thanksgiving and Christmas. A friend made a salad from julienned brussels sprouts with cranberries, almonds, spring onions, and a vinaigrette. They taste like a mild cabbage when raw. I have a recipe of roasted brussels sprouts with bacon, sautéed red onion, red pepper, Kalamata olives, and toasted bread crumbs sprinkled over the top. I could eat that for a meal. Room temperature sweet sour brussels sprouts are good too. I will be glad to give you out recipes. How do I get them to you? Roasted Brussels sprouts are delicious! Did you know that it’s actually Brussels sprouts, not brussel sprouts? A little known rule, for sure. I didn’t know that… and I had even googled the name! Clearly, I’ve not been paying close enough attention! This looks amazing!! The cranberries make it look so pretty. Those look fantastic!! I made some with pears and pecans last season and that turned out well though they were a little different since they were stir fried. And then I also love them roasted with olive oil, salt and thyme! Thanks for this recipe. Oh – now I’m going to have to try this too! Al things that I love and most of my family does too. We do something similar with 2 tbsp. olive oil and 2 tbsp. real maple syrup tossed with 1 lb of Brussels sprouts (trimmed and cut in half) roasted at 400F for 10-12 min. I got the recipe from a magazine a couple of years ago but can’t remember which one now. They end up nicely caramelized and slightly sweet. Even my picky eater will eat them! I love roasted potatoes & brussel sprouts with EVOO & garlic. I just wish my budget would allow them more often. I swoon over roasted brussel sprouts too! I am excited to try them this way, I never thought of cranberries! And girl, you NEED to try them with bacon. So delish!! Look it up on Pinterest! Confession time… I’ve never tried brussel sprouts. I’d love to give them a try. What do they taste like? I confess I haven’t tasted one either. I am apparently missing the ball on roasted veggies because I haven’t done that either. Thanks Amy! I have actually been wanting to increase our veggies and this will help me get started. Its usually just tossing them on a plate and saying you must eat two carrots, broccoli, etc. To me they taste kind of like a cross between broccoli and cabbage but not as strong as either of those. The smaller ones are less bitter and cook faster. Add various seasonings or mix them with other veggies or pasta if you’re worried about the taste being too strong. Looks delish! I don’t have a tried and true way to cook (and like) brussel sprouts yet…I’ll give this a try. We pretty much only roast our veggies…works awesome for carrots, green beans, , broccoli, etc. Although we usually cook them at 425 for 20-25 min. So yummy!! We always had boiled veggies growing up, which I love. BUT yes to oven roasted!! My husband who doesn’t like broccoli likes it oven roasted. I make it with garlic, olive oil, salt, and panko. 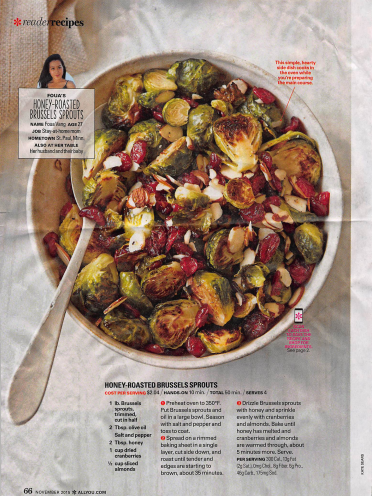 And I could see why anyone would like your Brussels sprouts recipe–equal parts Brussels sprouts and cranberries! ?. I think my kids would pick out the cranberries-but my husband and I would enjoy. Confession. I never liked Brussel sprouts or veggies growing up. I still have not liked Brussel sprouts but will give roasting a try. I like most veggies now but am eager to try roasting them. Steaming and stir fry get boring after a while. Thanks for the yummy looking recipe. I’ve recently become a brussels sprouts fan too after avoiding them all my life. I dont have an oven so I prefer mine boiled and then sprinkled with lemon juice and lemon seasoning and then roasting them a bit in a hot fry pan with a little butter or oil. So good!!! I dont like honey but will try adding cranberries and nuts. Crystal, have you ever tried roasting green beans? I buy a bag of the already trimmed beans and throw them in a roasting pan with some butter, salt and pepper, and garlic powder. Roast at 425 for 20 to 25 minutes and you’re done. My friend just told me about this a few months ago and it’s my new favorite way to eat green beans! No, I haven’t! Thanks so much for the yummy suggestion!! I cut this recipe out of all you magazine too! Can’t wait to try it. You can also cut the Brussels sprouts in half and saute them with garlic and your favorite oil. This also works with frozen where the roasting doesn’t work as well. 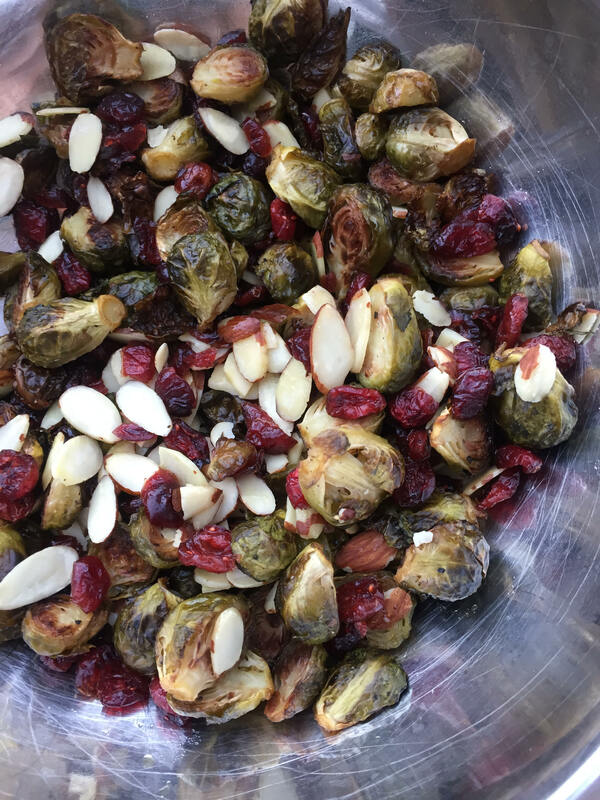 My whole family – kids included – are excited when I make roasted Brussels sprouts. I cut them in half, cook them with olive oil, salt, pepper, and cut up bacon! Just roast at 400 degrees until the sprouts and bacon are done, stirring every ten minutes. Usually it takes about thirty minutes, depending on the thickness of the bacon and the size of the sprouts. Delicious! Made some tonight and it is absolutely delicious! Thank you! I find that 1 pound of Brussels sprouts doesn’t yield that much…might have to double the recipe next time 😉 To be honest, this was my first time cooking Brussels sprouts (since I’ve never find them appetizing..) and it certainly won’t be the last time! For this recipe, does it matter if the Brussel Sprouts are frozen vs fresh? SO I made this tonight never have ate Brussel Sprouts before but I got them in my CSA and all I can say is yummy . My 9 year old love them too!!!! Yay! I’m so glad that you enjoyed them! I am making these tonight. I love roasted sprouts, my husband will eat them but my kids don’t care for them. I’m hoping with the addition of honey and dried cranberries that I can change their minds. 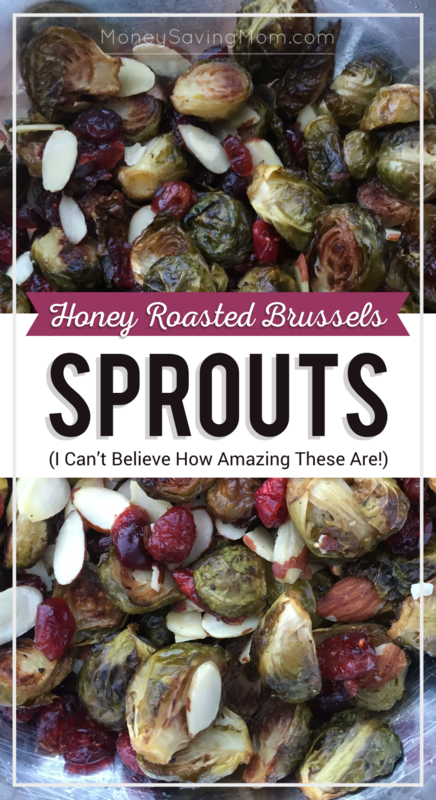 We like other types of roasted brussels sprouts, so we wanted to give these a try as well. On our family scale of 1-5 for new recipes, this was given 4s and 5s at dinner tonight. I wonder how this will work with frozen vs fresh Brussels sprouts? I have a bag of frozen ones I dint know what to do with. I am not a fan of them but my husband loves them. Maybe this can be the compromise meal ?